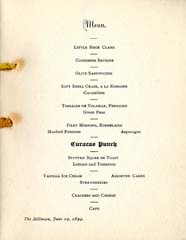 The Alumnae Association’s first event was a Commencement banquet for the senior class, held on June 18, 1894 at the Stillman Hotel. The senior banquet was an annual event that would continue for decades. 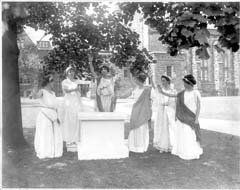 In 1897 the Alumnae Association began raising money for student financial aid. 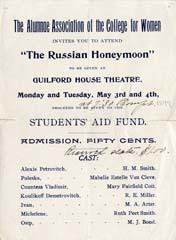 The fund was begun with $210 raised through performances of The Russian Honeymoon. The May performances were held in Guilford; admission was $.50. Thereafter, alumnae received annual appeals for contributions to the Student Aid Fund. Half of the annual contributions were invested. The other half plus interest from the investments were used for loans to students. This policy, established in 1900, continued until 1930, when the scope of expenditures was expanded to more general College needs. In 1901 “scholarships” totaling $200 were given to two students. By 1921, forty-five students had received no-interest loans totaling nearly $6,000. The Student Aid Fund was one of many scholarship funds established by the Alumnae Association. Contributions to these funds came from individual gifts, class gifts, bequests, and fundraising activities. Although the Alumnae Association sponsored a wide range of fundraising events, a recurring favorite was theatrical performances. 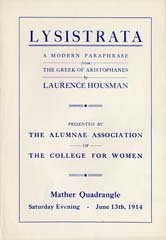 Following on 1897’s Russian Honeymoon, the June 1914 performance of Lysistrata cleared $185. Approximately half the proceeds was contributed to the Student Aid Fund. The other half helped furnish Flora Mather House. 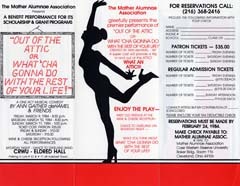 Seventy years later, the Mather Alumnae Association sponsored a performance of alumna Ann Gaither deHamel’s play, Out of the Attic OR What’cha Gonna Do With the Rest of Your Life?” to benefit what was then called Scholarship and Grant Programs. Information was compiled by staff of the Case Western Reserve University Archives, November 2007.